Apple cider vinegar has been used as a folk remedy for centuries. In 400 B.C., Hippocrates, the Father of Medicine used it for its powerful healing and health benefits. Apple cider vinegar (ACV) contains over 30 nutrients and has an extensive list of health benefits. 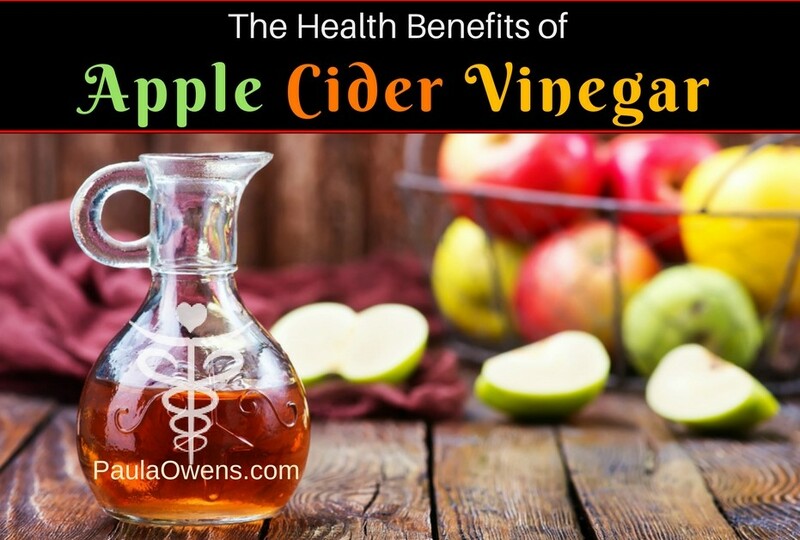 The most nutritious vinegar is apple cider vinegar that is not overly processed and filtered. Look for organic, unprocessed, unfiltered, raw apple cider vinegar that contains the ‘mother’ (a mix of healthy bacteria and enzymes). The appearance will look slightly cloudy and often there will be a pungent smell. Digestion. Apple cider vinegar is loaded essential acids that boost digestive fire, aid in breaking down food, and help to digest heavy foods and high protein meals. Shake the jar to mix the ingredients and drink 3-6 ounces of Paula’s Apple Cider Vinegar Digestive Tonic 10-20 minutes before meals to encourage better digestion, breakdown proteins, and ease heartburn and indigestion. Discontinue if you experience any adverse reactions. Relaxing, Anti-inflammatory Detox Bath. 4-6 cups Epsom salts, one cup baking soda, 4 tablespoons ginger powder, two cups of apple cider vinegar, 10 drops frankincense, 5-10 drops tea tree oil or your favorite essential oil. This is excellent for reducing excess uric acid in the body, and especially helpful for arthritis, bursitis, tendonitis and gout. The Epsom salts contain magnesium that will encourage relaxation and a good night’s sleep. Drink a glass of water before and after bathing. Sip on a cup of tea as you relax in the tub for 15-20 minutes. Afterwards, rinse off in the shower with 5 alternating cycles of hot and cold water at 15-20 seconds each cycle, ending with a cold water cycle. Deep cleansing facial mask. Mix the following ingredients together and apply to your face and neck: one teaspoon bentonite clay, one teaspoon raw organic honey, and a splash of apple cider vinegar. Leave on for 12-15 minutes. Perfect to do as you relax in the tub. Rinse off with cool water. More is not better! Although apple cider vinegar is safe and healthy for most people, consuming large amounts can be problematic. Side effects include erosion of tooth enamel, burning of the esophagus, throat or skin, and decreased potassium levels. Never drink ACV straight! Always dilute apple cider vinegar in water to prevent negative side effects. It’s always best to start with less and increase the dose gradually. Apple cider vinegar is high in histamines, a chemical that is released by cells in response to injury, inflammation and allergic reactions. For those who are histamine-sensitive or intolerant, ACV may not be the ideal antidote for you! If you’re taking diabetes medications, talk to your practitioner before using apple cider vinegar. Because apple cider vinegar may help reduce blood sugar levels, you may need to modify your dosage of diabetes medications to prevent hypoglycemia symptoms.